Norway has launched a nationwide search to recover a fragile version of one of the world's most famous paintings - Edvard Munch's The Scream. Armed robbers held up Oslo's Munch Museum on Sunday in a daring daylight raid to steal both The Scream and another Munch masterpiece, Madonna. Police said they had no idea who was behind the theft as art dealers speculated a ransom might be demanded. The pictures are thought to be too famous to be sold on the black market. "Most likely, the thieves will demand a ransom to deliver the paintings back," Knut Forsberg, manager of Norwegian auction house Blomqvist Fine Arts, told AP news agency. 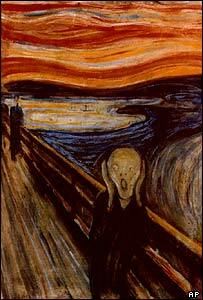 Mr Forsberg valued the stolen Scream - one of four versions completed by Munch in 1893 - at between $60m and $75m on the open market. The BBC's David Sillitoe says the ghostly, screaming white figure in front of a red sunset is one of art's most familiar images - a symbol of despair and alienation. 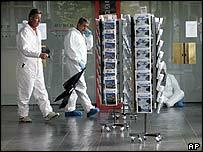 In the aftermath of the raid, police cordoned off the museum, informed Interpol and alerted airports and border crossings. The frames which had contained the two paintings were found smashed and discarded outside the museum while the gang's stolen black Audi getaway car was recovered a few kilometres away. The masked raiders were pictured on closed-circuit television. It has emerged that one of the three gang members spoke during the robbery in Norwegian but a senior detective said the investigation was wide open. "We're following all possible leads... but we don't know who did this," Detective Chief Inspector Kjell Pedersen told journalists. Asked about the possibility of a ransom demand, he added: "We have heard nothing." One witness, 63-year-old Texan businessman Richard Marcus, said the police had taken "a long time" to respond to the raid. Two masked men barged into the museum late in the morning, threatening a guard with a handgun before tearing the paintings off the walls and walking unchallenged out to a car driven by an accomplice, police said. Mr Marcus said he had seen one of the robbers "put a gun right behind a guard's head". Witnesses said the robbers bumped one of the paintings against the ground as they made off. The Scream stolen is a fragile version, done in tempera and pastel on board. 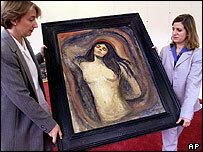 Madonna was painted during the same period and formed part of Munch's Frieze of Life series. The Munch Museum also possesses a second Scream while a third is at Norway's National Gallery and a fourth in private hands. A gang stole the National Gallery version in February 1994 but were arrested three months later and the painting recovered intact. A member of the gang, now out of jail, has denied any role in the latest robbery through his lawyer, Reuters adds. "The Munch gallery hopes they will see their paintings again"
Are the world's art treasures properly protected? What happens to stolen art?